Urbanna, Virginia just welcomed home the Mitchell Map, created more than 250 years ago and depicting a large portion of Eastern North America. Virginia Currents producer Catherine Komp brings you the story of how this small waterfront town acquired the historic map and the complex process to restore it. Learn more: Find out about Urbanna's history and the Scottish Factor/Old Tobacco Warehouse where the restored Mitchell Map is now on display. The First Edition 1755 Mitchell Map hangs proudly in Urbanna’s historic Scottish Factor building. Paul Malone: It’s described as the single most important map in American history and the guy from Urbanna here, John Mitchell, is the one who sat down and put it together. Since Paul Malone moved here two years ago, he’s been learning about the history of John Mitchell and the map. Malone: It was used to settle the Treaty of Paris in 1783. The Treaty that ended the Revolutionary War. Spain, France and Great Britain used it in subsequent treaties. And the last time it was used for official purposes? Malone: 1980. It was used by the United States and Canada to settle the fishing boundaries up off of Maine between the United States and Canada. The detailed, hand-colored map shows towns, settlements, tribal lands and water bodies; it includes historical, political and geographic notations, and an elaborate engraved cartouche. How did this small Virginia town acquire such a valuable piece of history? That story can be traced to long-time resident Jessie DeBusk. Jessie DeBusk: It really is the citizen’s map. DeBusk, now 97 years old, began learning about John Mitchell in 1974. At the time, she was working at the Bank of Middlesex. Jessie DeBusk: My boss at the bank called me at the office and said we were getting ready next year to celebrate the anniversary of the bank. He put her in charge of overseeing the 75th anniversary festivities. DeBusk: I was overwhelmed (laughs). I said, me? And I said, where do I start? And he said you’ll find a way. Part of DeBusk’s task was writing a brief history of the bank. She started digging through bank documents, court records and the vestry minutes for Christ Church and uncovered references to Dr. John Mitchell. DeBusk: In reading that I thought how interesting, he lived in Urbanna. DeBusk discovered Mitchell was born just across the Rappahannock River in Lancaster County. He was a travelling doctor, paid in tobacco, and a botanist who collected specimens and studied them for medicinal purposes. He owned four lots off of Urbanna’s Virginia Street, where he had a house, stables and laboratory. She saw references to his friends Benjamin Franklin, botanist John Clayton and English naturalist Mark Catesby. And DeBusk found out that Mitchell, after moving to London around 1745, became a cartographer. DeBusk: I thought how nice to get a map of Dr. Mitchell. I had never seen one, didn’t know what it looked like. As Chair of Urbanna’s Tricentennial Committee, DeBusk convinced fellow members that the town should try to purchase an original Mitchell Map. It took years of searching, but she found an antique dealer in Pennsylvania who was willing to sell his First Edition, Third Impression Mitchell Map for $7500. DeBusk: We did not know at the time where the money would come from but decide we’d go and take a look. On May 31st, 1979, DeBusk and two other committee members departed Urbanna at 6:00 am, traveling through thick fog. Their first stop was the Library of Congress to see other editions of Mitchell maps up-close. Then, they headed to Valley Forge, Pennsylvania and the home of W. Graham Arader. DeBusk: We got up there about Noon, and of course looked at the map and had lunch with Mr. Arader and did some more discussing about the map and decided we would bring it to Urbanna. So next morning, June the 1st, 1979, I went to work at the bank and Mr. Arader’s truck was parked at the back door. Two thoughts crossed DeBusk’s mind: Where were they going to hang the map? And how were they going to pay for it? The bank and town chipped in significantly, but DeBusk still had to raise more money. DeBusk: And I thought where’s the rest of it coming from? (Laughs) So I talked to the committee and decided we’d write a note to every citizen in town, (every) taxpayer, and ask if they would like to make a donation in memory or in honor of someone. The money came, in about two weeks we had the map paid for. Some children gave some, you know just pieces, little bits here and there, and we got our $7500. 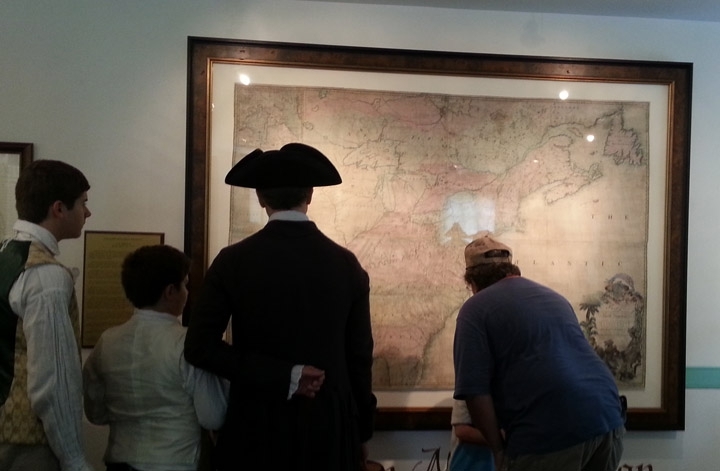 The Mitchell Map was put on display at the Bank of Middlesex where it hung for decades. A few years ago, town leaders decided it was time to restore the historic map. Wendy Cowan: The primary problem was extreme distortion. At the studio of Richmond Conservators of Works on Paper, Wendy Cowan and Mary Studt stand before the giant map - nearly five by seven feet in size. Cowan: There are eight separate pieces of paper in all and in the previous restorations they had been somewhat taken apart and forced back together. The use of inappropriate mending techniques caused wrinkles and creases, forcing the paper to hit the protective glass, in one area sticking to surface. Cowan: It’s just like little mountains, it was almost looking like a topographical map, rather than a flat piece of paper. The map also suffered from extreme discoloration. What was once a green Atlantic ocean had turned brown; areas were torn and some parts missing. Mary Studt pulls out a plastic bag containing pieces of the previous restoration done to an area near Newfoundland. Mary Studt: You can see the backing paper they had on it. This may have actually been the original paper, but they abraded the surface so much that they lost all of the original ink. And so you can see it’s all done by hand, the lines are all done by hand, all of the scale is done by hand. Actually, the in-painter did a pretty good job with what they had it was just, one, inaccurate and two, really noticeable just because the paper itself was so badly degraded underneath. Studt and Cowan spent more than 18 months restoring the map, removing surface soiling and multiple types of inferior adhesives. They washed the map, originally printed on high quality rag paper, through a special process that uses deionized water and small amounts of calcium hydroxide and ammonium hydroxide. Studt: Another thing that we did do after the washing and bleaching and rinsing is use calcium bicarbonate which is actually a slightly acidic chemical that produces alkalinity in the paper when it dries and so we then put more alkalinity back into the paper so it is more stable in future. After washing, adding alkalinity, sizing, infilling and mending hundreds of pieces, they inpainted areas of loss to the media. They lined the back with Japanese tissue to give it strength, and then humidified and flattened the map. The restoration was complex and time consuming, taking more than 600 hours to complete. Cowan says she knew the map so intimately, she dreamt about it. Cowan: It’s hard to work on something so intensely all day and not be able to let it go at night so I dreamed about the islands off the coast of Florida. For some reason, that primarily stuck in my mind the most. Back in Urbanna, town residents wanted to do something special to mark the return of the restored Mitchell Map. They organized Founders Day, which included live music performed in a vacant lot between the Post Office and ABC store that used to be John Mitchell’s property. Historical interpreters roamed Virginia Street, carrying out a day-long colonial drama. And behind the 18th Century Scottish Factor building, also known as the Old Tobacco Warehouse, local dignitaries gathered for a rededication of the Mitchell Map. Jessie DeBusk was seated in the front row. After short speeches on the map’s history and restoration, a John Mitchell reenactor presented a plaque to the Mayor. There’s much excitement and civic pride surrounding the restored map, now valued at more than a half million dollars. Some hope it will become a focal point of the town’s history, attracting more visitors and helping the economy. Residents are also proud of more contemporary figures, those who planned and carried out the Founders Day event, the conservators who painstakingly restored the map, and of course Jessie Debusk and the members of her Tricentennial Committee who had the foresight to search for and buy the map three decades ago. DeBusk says she’s still hunting down some unanswered questions about Dr. Mitchell and continuing to pursue her passions. DeBusk: I love history, seeing things preserved because without that history and the past you don’t have a future. It takes that past to come over and make us what we are today. For Virginia Currents, this is Catherine Komp, WCVE News. Photos of restoration process courtesy of Richmond Conservators of Works on Paper.